"Intermediate Indians" is a term used to identify a people living on the southern and central Labrador coasts between about 3,500 and 2,000 years ago. "Intermediate" signifies their historical position between their Maritime Archaic ancestors and the Recent Indians who succeeded them. The word "Indians" distinguishes these people from Palaeo-Eskimos whose distribution included the central and southern Labrador coasts at the same time. Curiously, and for reasons that are not at all clear to archaeologists, virtually no trace of Intermediate Indians has yet been found on the island of Newfoundland. Intermediate Indians are known from a large number of small coastal campsites scattered from the Strait of Belle Isle northward as far as the Nain area. The sites consist of collections of small cobble fireplaces in sheltered coastal locations. Sites may contain a single such fireplace or as many as several dozen hearths. Larger sites do not indicate larger populations, but are the result of repeated use, sometimes sporadically through the entire 1,500-year Intermediate Indian period. Radiocarbon dates from charcoal in these fireplaces provide the evidence for the duration of the Intermediate Indian occupation of the Labrador coast. A cobble hearth from the Iceberg site in southern Labrador. Charcoal from a nearby hearth has been dated at 2440 BP. Courtesy of J. A. Tuck, Memorial University of Newfoundland, St. John's, NL. Artifacts found in and around these fireplaces are few in number and consist of only a few types of tools and weapons. Projectile points, probably used to tip spears, are relatively large and are equipped with notches near their bases to permit them to be attached to a shaft. Un-notched flaked stone knives are also common at Intermediate Indian sites. Thin, narrow slivers of stone, called "blade-like flakes" by archaeologists, were also used for cutting. Stone scrapers, most common near the end of the Intermediate Indian period, were probably used for dressing hides and shaping wood, bone and antler. No polished stone tools–such as the axes, adazes, and gouges of the earlier Maritime Archaic people–have been found on Intermediate Indian sites. Nor have any of the many tools and weapons made from bone, antler, ivory, wood, skin and other organic materials been preserved in the acid soils of the Labrador coast. 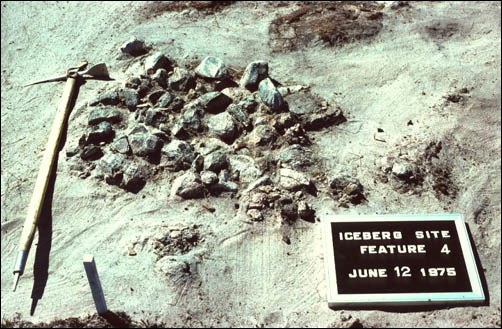 Tools from the Iceberg site in southern Labrador dated to about 2800 BP. The three artifacts in the top row are notched bifaces; those in the middle row are leaf-shaped bifaces; in the lower left corner is a lanceolate biface; the two objects in the lower right are linear flakes. Small bits of food bone, preserved by charring in Intermediate Indian fires, suggest that most animal species available along the Labrador coast were utilized for food, but the small samples of bone do not permit any firm statement to be made about the Intermediate Indians' economy. Some authorities suggest that their culture may have been more oriented toward land resources than the culture of their Maritime Archaic ancestors, but the coastal locations of their sites suggest a strong marine component in their way of life. Because of the meagre nature of the finds from Intermediate Indian sites, their history is somewhat less well understood than is that of some other Native peoples of the province. The styles of their stone tools, and choice of raw materials for tool manufacture, both suggest that the Intermediate Indians were the descendants of earlier Maritime Archaic people who may have entered southern Labrador as many as 6,000 years ago. Through time, the stone tools of the Intermediate Indians became smaller and came to resemble closely those of the succeeding Recent Indians. This, and the increased use of Ramah cherts, a favoured material of Labrador Recent Indians, both point to a historical connection between the two groups. The bulk of the evidence supports the contention that these people are not only "intermediate" in time between the Maritime Archaic and Recent Indians, but are also part of a long continuum of Native population that lasted from about 6,000 years ago until the present. For other related articles view the Precontact Peoples section of the Aboriginal Peoples Table of Contents.